After months of delays and anticipation, the VideoLAN team has finally launched a VLC app in the Windows Store, bringing the extremely popular video player to the 'Modern' interface of Windows. At this stage the app only supports Windows 8 and Windows 8.1, but the team hopes to add support for the ARM-based Windows RT in the future. The Windows 8 VLC app supports all of the same formats as the desktop version of the application, including often-unsupported containers such as MKV and codecs including FLAC and H.265. The team notes that the application is currently a beta and so might not be as stable as it should be, but it's complete for the most part. 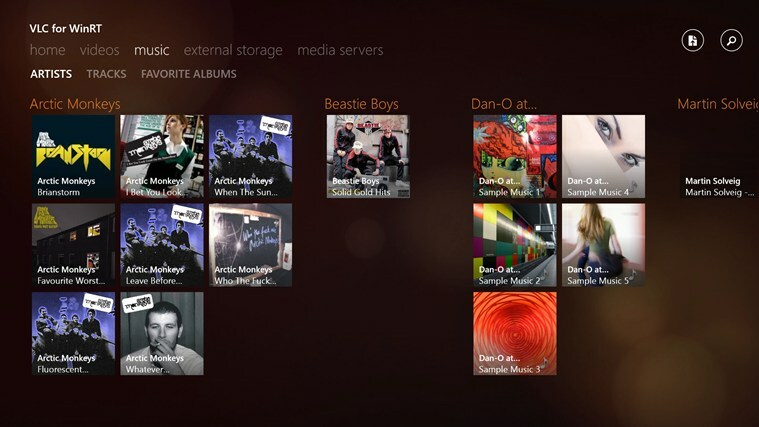 VLC for Windows 8 features an interface that aligns with Microsoft's 'Metro' design language, with separate categories for your latest files, videos, audio, external storage devices and media servers. There's also Live Tile support, and a video playback interface that's simple but functional. The development of a VLC app for Windows 8 and Windows RT was funded through Kickstarter, where users pledged the grand total £47,056 (~US$78,000) back in December 2012. More than a year later, the application is finally available for the public, and can be downloaded through this link here.